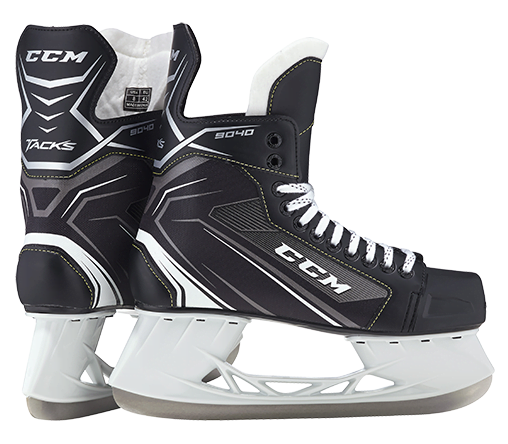 CCM Tacks 9040 Youth Hockey Skates | Sports Etc. QUARTER PACKAGE: Injected Mesh Technology helps create a durable boot with structural fitness and comfort. LINER: Brushed Micro Fiber is comfortable and offers a high resistance to wear. TONGUE: Felt 5mm tongue for comfort and protection. HOLDER/RUNNER: SpeedBlade Pro is a non-replaceable stainless steel blade with elevated holder for an increased attack angle. Sports Etc Performance To Value Rating– 9 out of 10- A great choice for any entry-level youth hockey player in need of a supportive boot.